Can 4th-gen MX-5 Miata renew interest in small sporty cars? The 2016 Mazda MX-5 Miata does on sale in North American this summer. Kogai: MX-5 Miata value goes beyond sales. 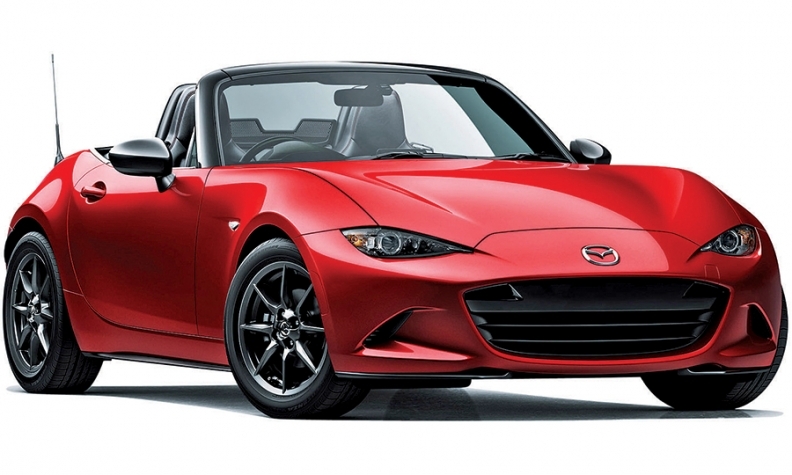 TOKYO -- Mazda Motor Corp. is betting a lighter, sportier, more fuel-efficient redesign will offset the next MX-5 Miata's lower horsepower -- and rekindle waning demand in the roadster segment. In Japan, where the car went on sale last week, Mazda even lowered the entry price to woo buyers. But the real test is North America, where the roadster goes on sale this summer with a higher sticker. The new MX-5 Miata will start at $25,735. That's a price bump of $945 over the outgoing 2015 model. Both prices include shipping. North America is the tiny Japanese carmaker's biggest market, accounting for nearly a third of its global sales. And for the MX-5 Miata, it will be even more important. While Mazda aims to sell 30,000 MX-5 Miatas globally, North America is expected to soak up at least half that demand, chief engineer Nobuhiro Yamamoto said at the car's May 20 launch event here. Mazda CEO Masamichi Kogai said the nameplate's value to the brand extends beyond its sales numbers. Mazda lowered the driver's position in the 2016 MX-5 Miata to improve handling and balance. "We don't have such high volume expectations, compared with the Demio [Mazda2] or Mazda3," Kogai said. "But it's a Mazda brand icon. ... It will help us raise the value of the Mazda brand." The Japan version of the car sheds more than 220 pounds to weigh in around a ton and achieves impressive fuel economy of between 40.5 mpg and 43.8 mpg under Japanese testing. While those figures don't convert directly into U.S. EPA ratings, they represent in Japan a 45 percent jump over the fuel economy of the outgoing model. In Japan, a smaller engine helps. Here, the new generation downsizes to a 1.5-liter powerplant from the 2.0-liter in the previous generation, and horsepower drops to 131 from 170. The U.S. version will get a new Skyactiv direct-injection 2.0-liter engine. That will improve fuel economy to 27 mpg city/34 highway for the automatic version from 21 city/28 highway. It also trims output to 155 hp from 167 hp. But Yamamoto says driving dynamics are better, thanks to the car's new chassis and lightweight suspension. "The horsepower figure doesn't matter at all," he said. Snipping out divots of metal between weld points. Punching holes through cross members. Using more aluminum and high-tensile steel. To demonstrate the point, Yamamoto snapped a magnet to the car's door at the launch event here, then held it to the aluminum front fender. It immediately dropped to the floor. Mazda improved handling and balance by making the car shorter, lower and wider. The engine was moved back and down, while the driver's position was lowered 20 millimeters (0.78 inch). The tweaks deliver a 50-50 front-rear weight distribution. Other features of the two-seater include a pop-up soft top that unlatches with the push of a button and can be easily rolled closed and open with one hand while seated. Mazda is also optioning a nine-speaker sound system from Bose. The layout includes headrest speakers that will allow occupants to enjoy music and take phone calls with the top down. 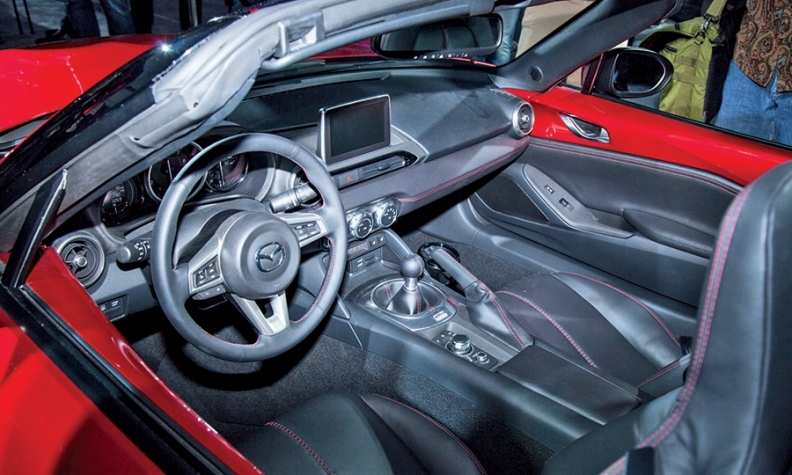 In Japan, Mazda also loaded the MX-5 Miata with its advanced i-Activsense safety options. The technologies include blind spot monitoring, automatic high-beam control, lane-departure warning, adaptive front lighting and rear cross-traffic alert. On the outside, the latest iteration is the first to get a globally unified design treatment, Yamamoto said. In past generations, the exterior would be tweaked for local markets, such as adding side-turn lamps for Japan or Europe. "We wanted to offer the same value to every customer worldwide," Yamamoto said. "They will all be the same." 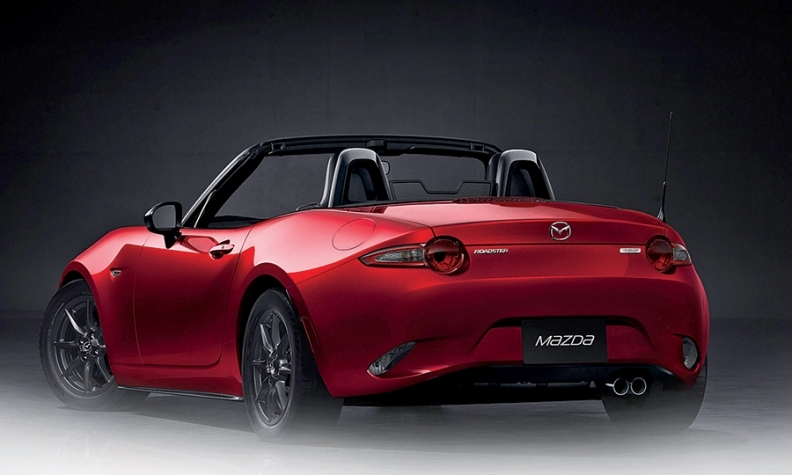 Mazda hopes the fourth generation fans the roadster's fortunes. Sales peaked globally at 75,798 vehicles in 1990, the year after the first generation debuted. North America MX-5 Miata sales hit an all-time high the same year, at 39,850 vehicles. By 2014, Mazda sold just 12,162 worldwide and only 5,410 in North America. The global market for sporty cars, including the MX-5 Miata, bottomed out with the 2008 Great Recession, Kogai said. Last year, he said, it totaled 400,000 cars worldwide, and Mazda forecasts segment demand to climb to 700,000 in 2017. But inexpensive roadsters are still an endangered species. In 2014, U.S. sales of compact sporty cars -- which includes the MX-5 Miata, along with the Scion FR-S, Subaru BRZ, Nissan 370Z, Porsche Boxster, Audi A5, Audi TT and BMW Z4 -- dropped 13 percent to 68,880 vehicles. The MX-5 Miata ranked fifth with just a 6.9 percent share of the tiny segment. Many of its mass-market rivals from the 1990s and 2000s -- such as the Honda S2000, Toyota MR2 Spyder, Pontiac Solstice and Saturn Sky -- no longer exist. The redesigned MX-5 Miata is the sixth model in Mazda's lineup to get the full range of Skyactiv drivetrain and chassis technologies. But it is the first application of the Skyactiv suite to a rear-wheel-drive vehicle. Configuring the new technology to the MX-5 Miata forced engineers largely to start from scratch. The car already has one big fan: Toyota Motor Corp. President Akio Toyoda. He sang its praises on May 13 at a news conference to announce a wide-ranging product, technology and manufacturing partnership with Mazda. In the run-up to the deal, he test drove Mazda's cars and said the MX-5 Miata was his hands-down favorite. "I really wanted to drive that car," the car-crazy Toyoda said. "That's a car I can really understand." Mazda will build a version of the MX-5 Miata to be sold by Fiat. But Yamamoto declined to comment on whether Mazda was considering supply deals to other automakers, including its new partner, Toyota.